History, Designs, of Ancient Celts in Europe: Late La Tene Culture: c.250-50 BCE. Late La Tene Period (c.100 BCE). 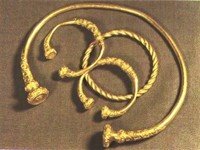 The art of the end of the Iron Age, when Celtic Europe, under pressure from the south, the east and the north, was on the defensive, has not yet aroused the same keen interest which is shown by specialists in early Celtic culture. The absence of any overall study covering the last two centuries BCE and the aftermath of Celtic art at the beginning of our era is regrettable. It should be mentioned, however, that exceptional finds, such as that at Fellbach-Schmiden, open up avenues of research which did not exist previously. The main explanation is undoubtedly to be found in the radical change in the material evidence available, i.e. in the archeological sources. In the second and first centuries BCE a change in Celtic culture meant that burials became rare and left hardly any trace in a large part of the Celtic world - chiefly owing to the wide-spread practice of cremation. Domestic accoutrements, often of humble appearance, therefore take the place of the richly decorated metalwork and ornaments of the preceding two or three centuries. In addition to this change in funeral customs, there was a gradual but fundamental change in Celtic society, due in part to the influence of the Roman or Romanized world. Before the end of the third century BCE this transformation was to lead to the development of the oppida, the first fortified urban settlements north of the Alps, which flourished in the second and first centuries BCE. In contrast with the homogeneity of the artifacts earlier in use, a wide diversity took place in the artistic activity of the "oppidum" civilization. This variety is responsible undoubtedly for the apparent disintegration of a sophisticated art with a strictly regulated mode of expression, which is disconcerting for the researcher who is without comparable material, and for the impression this gives of a break with the past. Continuity in the way of thinking and in the ideology of the Celts was, however, to take other forms. Celtic coin art, in particular, enables us to follow the evolution of an imaginative and dynamic style, capable of adapting motifs and transforming them into themes consistent with the Celtic vision. The quality of this artistic expression never falls below the "level" attained by the earlier works. Above all, the Celtic view of the world was to be expressed in the most varied materials and in objects serving a multitude of purposes. This seems to be a new factor, although this may be an illusion, given the sources at our disposal. A new category which might be described as "industrial art" - painted pottery, for instance - emerged and served as a means of expression for the development of Celtic crafts. However, some of this work is known only through objects that were used for long periods or discarded in the rubbish-pits of the dwellings, and no longer through "luxury" or "prestige" products such as those found in the burials of earlier times. The skill of the Celtic craftsmen - blacksmiths, bronze-smiths, coppersmiths, sculptors in wood or stone, glass-makers - is unquestionable nonetheless, and an ornamental tradition can be traced particularly in the metal remains, for example sword scabbards. Generally speaking, the style displayed on such objects tends towards a certain sobriety, where the decoration is flatter and the forms are defined by means of strict lines. Increasing use is made of techniques involving the use of gold or silver wire, bronze or iron wire is found in place of the lost wax process. Cloisonné enamelling becomes increasingly common. The compositions are much simpler, but the vivacity, power and originality of Celtic expression are preserved. This evolution, which followed a dynamic internal logic, underwent various influences - from the east that of the Eastern Celts and from the south that of Cisalpine Gaul. Initially, motifs were taken over and assimilated into the Celtic way but later the artists were submerged, by Rome in particular, and lost their creative force. With the new economic order and the gradual establishment of a new way of life - especially as a result of imports - art underwent a transformation. From the early first century BCE onwards, the creative powers of the Celtic artist waned and at the very beginning of our era they seem to disappear completely as a result of the massive action undertaken by Rome north and east of the Alps. A new ideology was installed and art took on a new, openly official significance. In spite of everything, the Celtic genius peers through in sculpted figures such as votive offerings in wood and the motifs painted on pottery, to say nothing of the actual forms. An artistic tradition survived and persisted, ghostlike, in the first century and the greater part of the second century of our era, and was to reappear sporadically in the second and third centuries CE, for instance, in the decoration of ceramics, mainly in Gaul. Thereafter, the post-Roman invasions were to leave their mark. On the Continent, in contrast with the insular world, Celtic art died a lingering death, except in the most inaccessible parts of the Alps, where traces of it may still be discerned today in the folklore. Unearthed in a rubbish-pit of the Gasfabrik settlement, this pottery flask is decorated with a curvilinear pattern, consisting of circles and S-motifs in the upper part of the vessel. The flask is painted in dark colours on a white field. The craftsman gave free rein to his penchant for coloured effects with these grave finds. This collection of a silver bracelet, a silver ring, two silver fibulae joined by a small chain, and a bronze ring, are representative of the simplicity and austerity of the decorative arts of the end of the Celtic period. Three Celtic coins and twenty-three Roman silver denarii accompanied this offering. These two horses' heads, turned face-to-face, are presumably from a shield ornament. They were worked up from the sheet-metal by means of a refined technique. Although the face and the detail of the hair show a marked Mediterranean influence, the form of the hilt and consequently the posture of the figure, are Celtic. Decorated with a highly stylized representation of a crane or strok, this helmet was perculiar to the Slovenian Celts at the beginning of the Roman era. This sculpture, found in a well and carved out of oak, was probably associated with the god Cernunnos, but only fragments of the composition survive, including the two opposing rams or goats. This type of composition is found both in the oriental motif of two ibexes, and in the iconography of the Tree of Life and the Lord of the Beasts. Many Celtic works such as the Korisios sword found at Port, Switzerland, and the scabbard found at Mihovo, Yugoslavia depict this same composition. Deposited in a dismantled form in a peat-bog as a votive offering, this cauldron probably originated in the Balkans, on the eastern edge of the Celtic world, and is the most informative physical representation of Celtic mythology. From the southern edge of the Celtic world, the severed human head represented by this stone sculpture combines Celtic and Ligurian elements.  For more on the history of late European Celtic crafts, see: Homepage.